When the ice begins to form, the fish slow down in their feeding habits. So my first instincts are how to improve my fishing skills through the ice. As a beginner in ice fishing 25 years ago, I was introduced to a slip bobber. I found out really fast how sensitively the fish were biting on my line, and I had to be very attentive in watching the bobber before I could catch a fish. I was not really sold on the idea of a slip bobber because when I broke my line, my hands were too cold to reset it. My final product is the “Ice Fishing Tip Down-Tip Up” featuring “Original Blue” and “Big Red”. They have been on the market for a couple of years now and reviews show that they are the most durable tip downs available. Order yours at bullnoseproducts.com. The next year someone gave me some piano wire and beads to make a spring bobber. I liked the idea for sensitivity, but when it got really cold I was always sucking the ice off the eyelet to get my line to drop into the ice hole. Years went by, and then one day I saw a wooden tip down! The rest is history! I began to invent a nice tip down. It gave me incentive to use my own reflexes when catching a lot of fish. Today I like large eyelet-short poles for hard water fishing. Tip downs are the only way to ice fish for quick action and satisfaction! 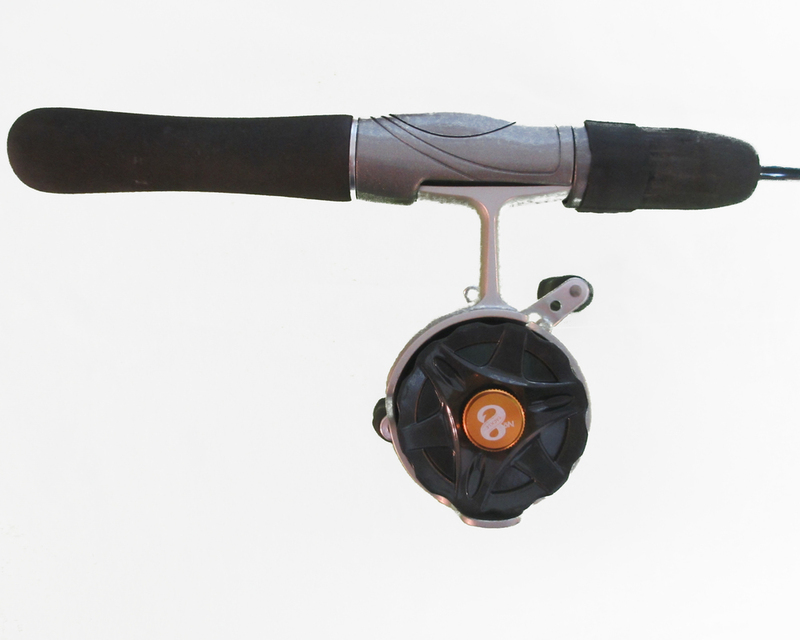 NEW IN-LINE ICE FISHING REELS. . .
Well it’s time to start looking at a new ice fishing season. I went out to my garage to check on my ice fishing equipment, and I noticed that everything had dust on it! Oh how quickly the summer months went by. . .
· Does it have room in the handle for your gloves? · Does it have a good winding ratio? · Does it have a good drag system? · Does it have a good release button for the spool? By performing all of these tests, I found one main thing to watch out for. . .when you do a dead stick drop, make sure you have your finger on the reel to prevent backlash on your line, or you spend a lot of time getting the rat’s nest out of your spool. All I can say is, “good luck!” in picking out your new in-line ice reel. Ice fishing season is just around the corner and we want to make sure that you are equipped and ready. Bullnose Products features Original Blue Tip Down-Tip Up and Big Red Tip Down-Tip Up. They are very simple and easy to use and made of sturdy metal with a fold-up design. Bullnose Products Tip Down-Tip Ups are designed to hold some of the most popular reels on the market today. No. 8 Inline Reels, Open Face Reels, and Closed Face Reels are some of the most common that handle really well with both Original Blue and Big Red Tip Down-Tip Ups. Don't wait any longer and order your Tip Down products today. Ice fishing Tip Down-Tip Up on a beautiful frozen lake located in British Columbia. Thank you Enzo Caccavo for sending in and sharing your picture.